This plan shows the new roads laid out across Lambeth and Southwark in the 18th century. 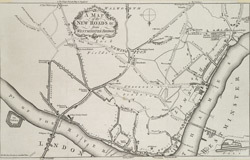 The title and compass star appear at the top of the plate, with proposed southern approaches to Westminster Bridge indicated by a dotted line. Until the 18th century, Lambeth was mostly marshland. The few roads connecting small settlements in the area were raised against floods.